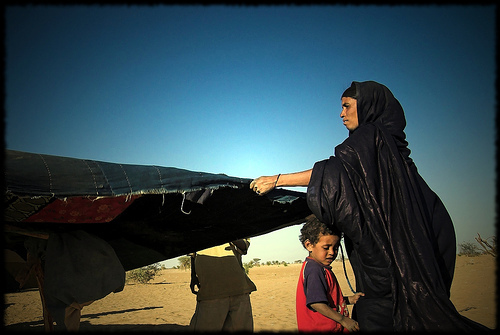 A Malian woman builds a small tent for her family so that her guests can sleep in the family’s home. In my book project I use the phrase “hospitable code” (this also serves as the title of the project) to discuss software that addresses the problem of the other. But this phrase requires some unpacking, and I’d like to work through that unpacking here. My hope is that readers will respond to this post so that I can continue to refine this idea/concept. The hospitality I have in mind is less an intentional, welcoming gesture than it is a predicament. In networked environments, others will continually arrive. This situation has its promises – the crowdsourcing of various problems and the possibility of a more inclusive conversation are two such promises – but it also has its pitfalls. Which others will arrive and when? What are their motivations? Who are they? How do I engage them? What will they do to me or my “home” or my text? Networked software is forced to deal with all of these questions in ways that an application such as Microsoft Word does not. To be sure, other writers can enter and edit my word document; however, this is not necessarily an integral part of the software platform. Word can be a perfectly useful piece of software on a machine that is not networked. Media Wiki, on the other hand, would be much less useful in a non-networked environment. One could use Media Wiki as a kind of content management system or as a personal CVS repository (I myself have used wiki software in this way), but this does not change the fact that the software was designed for networked environments and thus takes particular ethical stances with regard to other users/writers. My case study in “Hospitable Code” is Wikipedia and its software platform, Media Wiki. Media Wiki is hospitable in that it deals with the question of the other much more explicitly than an application like Word. Whether or not Media Wiki is sufficiently hospitable or whether it welcomes all others is a more difficult question. No software platform teaches a pure hospitality (what Derrida would call absolute hospitality). This is an unreachable ideal. Nonetheless, hospitable code addresses the question of the foreigner in particular ways because the arrival of others is part of its functionality. Media Wiki is just one example of hospitable code. We could consider a variety of software platforms that deal with a similar set of questions: Google Documents, Google Wave, networked videogames, Twitter, Facebook, and many others. Further, given the recent trend toward online applications, it seems that more and more software platforms will be forced to deal with the question of the other. My book is an attempt to think through the implications of that shift and to understand the ethical stances built into software. Building upon this definition of code as law, I am arguing that software makes ethical arguments – code establishes ethical codes. Those ethical codes are not the final word, and my project demonstrates how users grapple with and interrogate those codes. Nonetheless, code establishes a groundwork or a context in which we deal with one another, and in this sense code establishes an ethical dwelling (an ethos) in which rhetors/users/writers interact with one another. Those interactions are, in my view, inherently rhetorical. But Burke’s definition goes further than this by redefining rhetoric in terms of identification. In A Rhetoric of Motives, Burke explains this framework: “A is not identical with his colleague, B. But insofar as their interests are joined, A is identified with B. Or he may identify himself with B even when their interests are not jointed, if he assumes that they are, or is persuaded to believe so” (20). Thus persuasion is happens (whether the result of an intentional effort or not) through identification, but this identification is not one of fusion or communion. When ‘A’ identifies with ‘B,’ they are substantially one, but each remains a unique individual locus of motives, joined and separate” (20). By understanding persuasion, and thus rhetoric, as identification, we can begin to see the relationship between rhetoric and ethics. Rhetoric as identification implies that we are simultaneously joined and separate from various interlocutors, and any understanding of this predicament will have to engage questions of ethics and how we relate to one another. Persuasion involves “the use of stylistic identifications to establish rapport” between rhetor and audience (46). That rapport is in constant tension as we make and break various identifications and as we deal with various others. We are consubstantial with one another, but we are never fused in any final way. Understood as identification, rhetoric becomes the indissociable from how we relate to one another. Any time we are making meaning, any time we are attempting to communicate, we are in the realm of identification and we are determining how we can or should relate to one another. Questions of rhetoric and ethics are thus intertwined. This would seem an odd claim given certain definitions of rhetoric. Given a definition such as Locke’s(an instrument of “error and deceipt”), rhetoric is decidedly unethical. And certain rhetorical moves are indeed unethical. However, following Burke’s lead, I see no communicative act that is not shot through with rhetoric. And thus I see no way in which communication does not imply questions of ethics. The study of ethics is the study of how we treat the other (that other can be human, but it does not have to be). The question of the other is the question of ethics. In Derrida’s terms, the question of the “foreigner” (the foreigner here is a kind of metaphor for all of the various others that arrive on our various scenes…or on our desktop) is the question that continually presents itself to us. How we engage the foreigner is directly tied to how (or whether) we identify with the other. The difficulty here is that we do not always choose our identifications. As persuader or persuadee, we are constantly dealing with various, conflicting identifications. We are persuaded (or, better, persuadable) over and beyond any decision to agree or disagree, and we our own acts of persuasion entail identifications that we may or may not have “stylistically” deployed. In this sense, we persuade and are persuaded more (and less) than we ever intend. Thus regardless of whether we are in the “sender” or “receiver” slot, we are in an ethico-rhetorical predicament. So, hospitable code is rhetorical and ethical; it makes ethical arguments. To some extent, all software makes ethical arguments and determinations. But the networked software that I am most interested in must explicitly address the question of the other. In networked environments, the question of the other is part of the software’s design. When we enter the rhetorical dwelling of a space like Media Wiki, we are put into relation with various others. Those various relations are rhetorical and ethical. There is much, much more to say here (thankfully…if there wasn’t, then I’d be hard pressed to turn this into a book-length argument), but I’m hoping this can be a starting point. I’m hoping that some readers can help me continue to refine this set of ideas. Comments, questions, and suggestions are welcome. Thanks for your post, Jim. As you know, I’m coming more from the rhetoric side than the code side of the conversation, so some of my questions might point more toward my ignorance than possibilities for your project. When I think about the relationship between rhetoric and ethics, I often come back to the notion of “noise” (a term I associate with Diane [Davis]). To put it in terms from your post, one of the main ethical challenges we face as rhetoricians (and more broadly as people engaged in rhetoric) is the problem of recognizing the foreigner. It is one thing to recognize an ethical obligation to the other that we find ourselves confronted with; it’s another thing to recognize the obligation we have to the other we don’t recognize. In other words, some possibilities for identification present themselves to us only as “noise” (rather than intelligible communications) if at all. One of the questions for me when it comes to the intersection of rhetoric and new media studies (or whatever your preferred term is; my current interests focus on Bogost’s notion of procedurality and the intersection of rhetoric and games) is the extent to which computational/procedural/digital technologies can process or register noise. Since this “noise” can take a number of forms (frequencies, timbres, etc. ), the question quickly becomes pretty broad and vague. In the world of videogames, some people are trying to answer this question (at least, their work can be read as an answer to this question) through approaches like motivated reinforcement learning in which non-player characters are designed to adapt their behavior to the actions and inputs from the player. Rhetorical Peaks is invested in this question right now. So, for all of the technologies you are interested in, what sorts of noise do they register? What sorts of noise will they never hear? In this sense, part of the question concerns whether or not a given technology opens itself up to foreigners (this can be a question of open-sourcing, accessibility, etc. ), but it also concerns what sort of foreigners are welcomed and allowed for. As you show in your work on Wikipedia, that approach to creating an encyclopedia creates a corresponding ethos based on citations. Anyone can be an authority if they have the citations to back up their knowledge (although I’m not sure that gloss does justice to your argument). In Wikipedia, foreigners are welcome, but they have to follow the correct procedures. The question I’m thinking through w/r/t Rhetorical Peaks right now is the extent to which any given embodiment of procedurality (such as a videogame) can undo its own procedures. To what extent can the rules of a game adapt and respond to the players? I’m not sure this helps, and I don’t have many solid answers to these sorts of questions. The conversation reminds me of Schtitt and Mario’s conversation in Infinite Jest (p. 79-85). Here Schtitt thinks of tennis as an opportunity for one to “compete with your own limits to transcend the self in imagination and execution…You seek to vanquish and transcend the limited self whose limits make the game possible in the first place” (84). If we apply the same description to the game of rhetoric, then the vanquishing and transcending of the limited self always occurs in the presence of the foreigner (what would this transcending of self be if not a becoming-foreign?). Schtitt’s reference to Cantor and various sizes of infinity are relevant here as well. With this in mind, it’s clear to me how tennis and rhetoric open up possibility spaces where the only limit is “the player himself” (84). Of course, from this perspective, the “foreigner” in tennis appears to the player as a ball coming over the net. In rhetoric, the foreigner appears in any number of ways. How does the field of code allow the foreigner to appear? In what ways can the noise of the foreigner appear to us digitally? What sorts of foreigners cannot be translated into code? Thanks for the comment, Matt. Let me tackle your post in a couple of strands. I actually think I disagree with my previous self on this statement. In the CCC article you’re mentioning, I think I’m giving too much credit to the code and not enough credit to the actions of those engaging with that code. Essjay actually broke procedure, and Wikipedia didn’t stop him from doing this (he pointed to his credentials, which is supposed to be a no-no). One of the more interesting claims Bogost makes in Persuasive Games is that it’s “procedures all the way down.” Even when we break procedure, that’s another procedure. So, a gamer playing a game in which they “become” Lee Harvey Oswald has to follow the procedures of the game to a certain extent (s/he has to shoot the president). However, they can play the game to different ends, they can try to “break” the game. Bogost’s hope is that they will walk away with some new way of thinking about the world (that they will question existing procedures). All of this is to say that procedures are not as top down as they sometimes appear to be. In the world of gaming, we often have to follow them to get the game to work. But this can operate in ways that those procedures (or that the authors of those procedures) did not intend. First, I want to distinguish between two kinds of “code.” First, there’s the the translation of computer languages into 1’s and 0’s. This is not my focus (at least not in this post). Your final question seems to address this kind of code/coding. The typical answer here is that code (translation into 1’s and 0’s) is not very hospitable to noise or to the foreigner. In a certain sense, this is true. But in another sense, this is a misleading claim. I tend to think that programming/coding is more hospitable to noise than we’d think at first glance. Programming languages are closer to human languages than 1’s and 0’s. That doesn’t mean that the code can be ambiguous. It has to be fed into a machine. And any noise has to be cut out so that the program will work. But programming languages are systems of symbolic abstraction that allow humans to program in a way that is closer to human language than it is to 1’s and 0’s. So, computer languages do allow for some “noise” in the circuits (at least this is my view), but it’s not necessarily my focus in this project. However, my use of the term “code” is more in reference to how software works. In this sense, I’m using “code” as a synonym for “software.” While I’m interested in the verb (“coding”), this is more in reference to the arguments we build with code than it is with the question of translating human ideas into 1’s and 0’s. The reason I don’t focus on the latter is this: we don’t always experience the outputs of software in terms of binary logics. Yes, at bottom, software is all 1’s and 0’s. But that digital code builds software that does not always operate via binary logics (or in ways that allow us to interact with one another in ways that are not a “slave” to the binary.” So, when I say hospitable code, I actually mean something closer to “hospitable software.” The actual act of coding (translating human ideas for machines) is important to me, but it probably isn’t my focus. I’ll have to think this through some more….on to the rest of my answer. Hospitable code means that we are put into various identificatory predicaments. Thus, others arrive, regardless of our conscious choice. Those others (as you note) always bring me more than I can receive. The other presents herself/himself/itself, and we interpret her/him/it. That interpretation is an attempt to cope with noise – with the abundance of alterity that arrives in front of my (or at my door). Filtering out this noise is unavoidable, but it also entails certain ethical problems. When I interpret the other, I impose my meaning on that other. I present the other to myself not as other, but as something I already know. I filter noise in the name of making meaning. So, the software I have in mind puts us in this predicament, but this isn’t a new predicament. We have always had to deal with the arrival of the other. As Ronell argues with the telephone, technology “is reflective of different registers of being” (UberReader 3). The telephone puts us on call. We have always been on call, and the telephone doesn’t create this predicament. It is reflective of it. Hospitable code works in a similar way. Software that “builds in” the arrival of the other has to deal with the arrival of various others (those we desire and those we don’t). So, hospitable code invites a certain kind of noise. It invites more others than platforms that run on our desktop (my example was Word). That means that hospitable code has to take up the question of the other. Now, when it takes up that question, it doesn’t do so in a utopian sense. It filters a good bit of noise. However, it’s interesting to think of Media Wiki and Wikipedia in this regard, particularly with regard to the idea of “community.” Media Wiki software (and its most famous instantiation, Wikipedia) extends an invitation to various others. Those others arrive, regardless of their identities, credentials, or agendas. Those others are part of the “community,” a community of noise. Many will define the Wikipedia community as the “inner circle,” those who spend time working out policies and editing material. But the “anonymous” users (Wikipedians call them “anons,” even though they’re not really anonymous, which is another blog post altogether) of Wikipedia are part of the community as well. In a sense, this community shows us the difficulties of Nancy’s “inoperative community,” a community that is not a project of fusion or communion but is rather a constant “unworking.” The only way to define this wiki-community in terms of communion or a shared project is to filter out all of the noise (the anons) and to ignore all of clashing agendas and identities (what I have called “colliding collusions”) of this digital space. So, the code itself (Media Wiki) extends an invitation to a broad range of writers. It invites noise, and it invites others who will bring more than anyone could ever hope to interpret. When Wikipedians or their critics attempt to assert something about the Wikipedia “community,” they interpret that noise (and filter it) in the name of meaning.